WHO nomenclature: Central neurocytomas are grade II tumors. They are classified as “neuronal or mixed neuronal-glial” tumors in the WHO classification of brain tumors. Extraventricular neurocytoma is a new entity in the 2007 WHO classification system. Although both central and extraventricular neurocytomas are composed of similar cells, the term “central” neurocytoma is restricted to tumors lying within an intracerebral ventricle. 50% anterior lateral ventricle: Central neurocytomas are classically located in the lateral ventricles and/or in the third ventricle. The most common site is the anterior portion of one of the lateral ventricles (50%), with a preference for the left, followed by extension into the lateral and third ventricles. 13% have been reported as having biventricular location. In 3% of cases the tumor may be confined to the third ventricle. Extraventricular and atypical neurocytomas different: The group of neurocytomas occurring outside the ventricular system, the so-called “extraventricular neurocytomas” have different characteristics. Similarly, the group with cellular atypia and high MIB-1 labeling indices have now all been included in the group of “atypical neurocytomas” (see below). Solid +/- cystic components: The tumors may be solid or have firm solid as well as cystic components. Typically not infiltrative: The classical central neurocytomas grow as focal tumors without infiltration into surrounding tissues. The atypical ones do, however, often show features of local infiltration. Low proliferation: Proliferative potential as measured by Ki67 labeling (12), immmunostaining for proliferating cell nuclear antigen(PCNA), or silver colloidal staining for nucleolar organizer region(AgNOR) usually registers a low proliferative index (13, 14). A recent study with MIB-1 antibody showed that tumors with a labeling index greater than 2% have a greater chance of recurrence (15). Gene mutation patterns seem unique: Gain on chromosome 7 was observed in 3 of 9 neurocytomas (16). In two others, an isochromosome 17 and complex karyotype were reported (17). Central neurocytomas are genetically distinct from oligodendrogliomas, and chromosomes 1p and 19q probably do not play an important role in their pathogenesis. N-myc and EGFR amplification are rare. In one study (18), after hybridization and fluorescent staining of the bound DNA, regions of gain or of loss of DNA sequences were detected as changes in the tumor/normal fluorescence intensity ratio along the target metaphase chromosomes. The neoplastic cells can express photoreceptor differentiation, possibly relating central neurocytomas to pineocytomas (19). TP53 mutations and Myc-N amplifications are not detectable in these tumors (20). Central neurocytomas are neuroepithelial tumors made up of uniform round cells that show immunohistochemical and ultrastructural characteristics of neuronal differentiation. They also have fibrillary areas mimicking neuropil. Histology: The overall appearance is benign (see above). 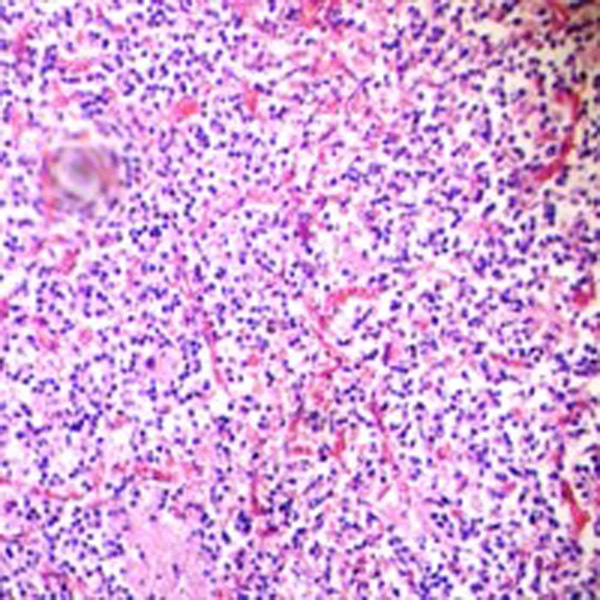 Various histological patterns may be present in the same tumor, including an oligodendroglioma-like feature with honeycomb appearance, large fibrillary areas looking like the “rosettes” of pineocytomas, cells arranged in straight lines, or the perivascular pseudorosettes characterizing ependymomas. The nuclei have a salt-and-pepper chromatin pattern with occasional small nucleoli evident. An arcuate capillary pattern is noted in the background of the tumor. Focal dystrophic calcifications may be seen, but mitotic activity, vascular proliferative patterns, and necrosis are all absent. Immunohistochemistry: The tumor cells stain positive with antibody to synaptophysin and do not stain positive with antibody to GFAP. Electron microscopy: On electron microscopy, numerous thin and intermingled cell processes with features typical of neuritis, including microtubules and dense core and clear vesicles, are observed (21). Increases of GFAP positivity and vascular proliferation of the central neurocytoma may be alarming signs that suggest a malignant course in addition to the other atypical features (22).